I almost literally grew up in church, but I wasn’t raised in a faith tradition that followed the liturgical calendar or used the language of spiritual disciplines or practices. It wasn’t until I was well into adulthood and studying at North Park Theological Seminary that I learned about the rhythms of the lectionary and seasons of ordinary time. Those formational exercises, both new and ancient, helped me grow in my faith journey. I was no longer limited to morning devotions and personal time of prayer. I’d found, in fact, many ways to grow in God’s word and deepen my prayer life. Those discoveries were liberating! Cue the sound-track of Disney’s Aladdin—a whole new world opened up for me. a portable labyrinth printed on a large cloth. At a quick glance, a labyrinth can look like a maze. But unlike a maze, a labyrinth has only one path. While it contains twists and turns, you cannot get lost and there are no dead ends. 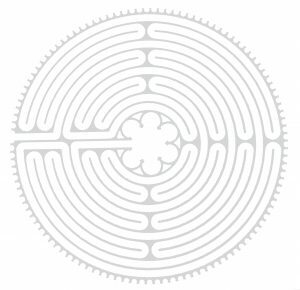 I was intrigued about the idea of walking a labyrinth and had made some half-hearted online searches to find one near me. But my first encounter was much different than I had imagined. 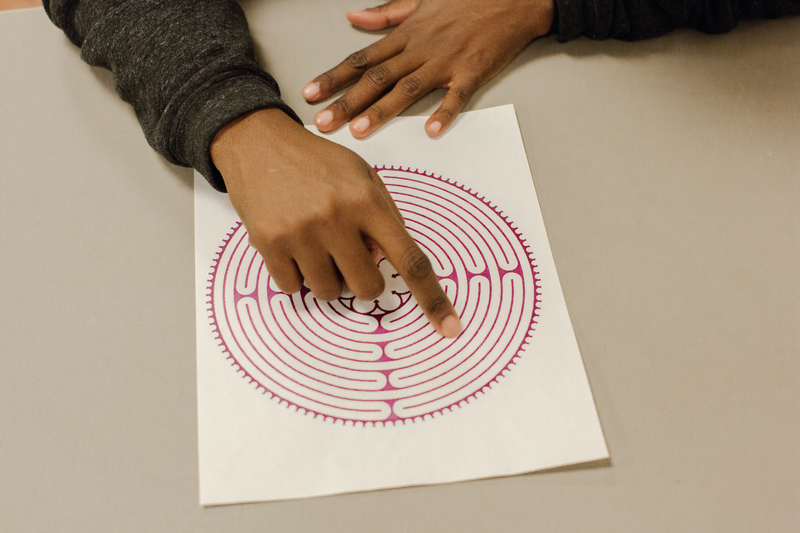 I was co-facilitating a workshop, and my partner started the day by handing out a sheet of paper with a labyrinth printed on it. We were instructed to trace our finger along the path while listening for how God might speak. To say I was skeptical is an understatement. However, I decided to keep an open mind and give it a try. I was shocked by how clearly and quickly God spoke to me during the experience. Shortly after beginning the labyrinth, I found myself close to the center. Then, in the blink of an eye, I wasn’t. It was a visual and tactile representation of exactly what had been going on in my life in the months leading up to that moment. Just as I thought I was approaching a breakthrough in my life, my situation would become even more hopeless. While it seems as if my finger labyrinth experience might have created a greater sense of hopelessness, something about seeing my situation from a bird’s eye view was comforting. A little over a year later I found myself leading a group in a finger labyrinth exercise. While I expected it to be powerful for them, I wasn’t expecting my own experience to be as meaningful. After all, it was the exact same labyrinth—how could I possibly experience it in a new way? Again I had a deeply moving experience with God. This time I was struck by how easily I could get off-track if I didn’t pay attention. If I didn’t keep my eye directly on the path my finger was tracing, I would end up somewhere I wasn’t supposed to be. It was a reminder to stay focused, even during life’s twists and turns. And it was a message I needed for that time in my life. In between those two experiences, I had the opportunity to walk an indoor labyrinth. That, too, was a holy moment for me. When comparing the experiences, I cannot say that the physical act of walking the labyrinth was any more profound than letting my finger do the walking. In fact, I found that the bird’s eye experience of the finger labyrinth actually provided clearer insight from God. Many writers highlight the way the twists and turns of a labyrinth mirror life’s twists and turns. What stands out most to me is the experience of being so close to the center in one moment, then suddenly finding myself heading in the opposite direction. The path seems to be leading me away from the center, but it eventually takes me where I need to go if I stay the course. Also, a full walk of the labyrinth involves walking to the center and then retracing your steps to exit. Our faith walk is often cyclical. As I walk it a second time, I am aware that I have walked this road before. Yet I gain new insights or perhaps confirmation of previous understandings. I am a very tactile person. When I visit art museums, I have to keep my hands in my pockets to resist the urge to touch works that are especially textural. I have found that prayer labyrinths, both full-sized and small, engage my sense of touch. I think that’s one reason I took to the exercise so well. Yet, even if you don’t consider yourself a tactile learner, this prayer practice can be moving and powerful. Sometimes we have the most transformative experiences when we step outside our comfort zone. 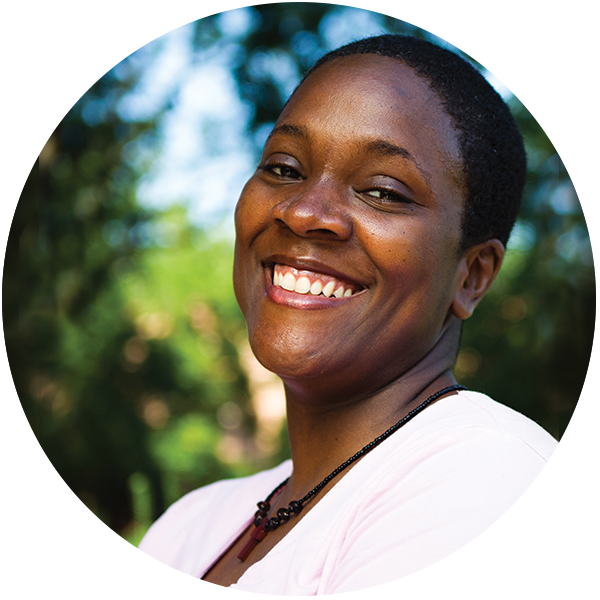 Nilwona Nowlin serves as a minister of Kingdom Covenant Church in Chicago and as the executive director of Kingdom Oaks Community Development Corporation. You can follow her at thedreamerspeaks.com. I’ll pray that you don’t. I echo Marilyn’s comments below. Dear flock of the Lord, please stop being deceived by pagan experiences, and seek the Lord according to His Word. He warns His children over and over, not to follow pagan ways, not to be deceived. He tells us how we may approach Him. Please heed the warnings. Just because you have “an experience” does not mean it honors God or is from Him. Weeping for discernment in our flock. Some thoughts on using the labyrinth from sources i have researched. ” God is not obligated to provide spiritual experiences simply because we initiate or expect them. Seeking an experience is self oriented not God oriented. Having an “experience”does not mean it is from God”. Greek mythology, false prophets, murky history brought into the basilica so the “church” could let the pagans feel included as some of these devices/rituals were familiar to them. Lack of discernment has a payday. Some information taken from : What is a prayer labyrinth? Are prayer labyrinths biblical? Thanks, Nilwona – I walked my first labyrinth a few years ago. Walking forces (me at least) to slow down, not rush too fast to reach a goal. A finger labyrinth sounds really interesting. I hadn’t known of it before. I’m looking forward to trying it. I hope it’s a good experience for you, Judy! It’s surprisingly easy to get “lost” in the finger labyrinth, so you’ll have to stay on your “figurative” toes! Thank you for telling us your spiritual adventure! Labyrinths have been profound and holy prayer times for me too. While on a vacation tour I was excited to see the famous Chartes Cathedral labyrinth. Our guide prepared us while we were still on the bus. “What I want everyone to do is follow me and go straight to the center of the sanctuary, turn around and look up at the incredible rose window. There will be people milling about when you enter but just cut through the crowd to get on the main aisle.” We exited the bus to enter the church. To my surprise, the labyrinth was just inside the doors. Many people were praying on it. I then realized they were “the crowd milling about” that we were supposed to cut through! I still chuckle when remembering it. Hahaha, that sounds like it was quite a surprise to walk into. But what an amazing thing to experience! P.S. It was great meeting you at MW!